F-16.net • Lockheed to offer Japan advanced F-22 F-35 hybrid? Re: Lockheed to offer Japan advanced F-22 F-35 hybrid? SpudmanWP wrote: I am not sure what source you are looking at, but the F-35's "combat radius" is much more than the F-22's. The below shows a non-supercruise F-22 A2G combat radius of under 600nmi while an F-35A in the same config can take twice the bombload (2x2k JDAM) to 669nmi and the same bombload (2x1k JDAM) to ~710nmi. 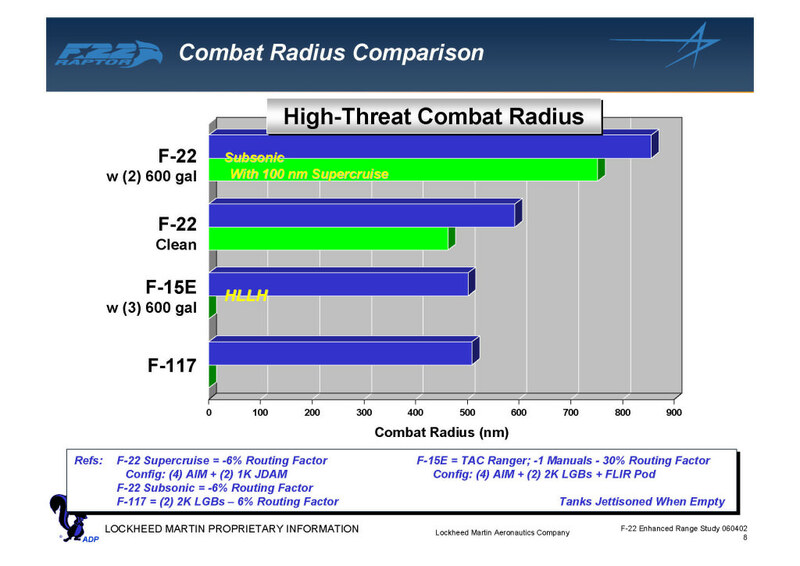 The same chart also shows the F-35A handily beating the F-15E (w/o CFTs?) & F-117. I'm a bit skeptical that a clean F-22 can outrange an F-15E with three 600 gallon tanks and (presumably) CFTs. Bombers flying clean versus external loads were a significant range difference. It makes me wonder what kind of beast F-106A could have been with some modern love in its lifetime. sferrin wrote: I'm a bit skeptical that a clean F-22 can outrange an F-15E with three 600 gallon tanks and (presumably) CFTs. Look at the small text. The F-22 has an 6% routing factor, meaning take the range you see and increase by 6% for actual flown range (590nm subsonic only to 625nm actual flown). The F-15E has a 30% routing factor (500nm to 650nm actually flown). Stealth enables more direct routes which increases range. Also, the F-15E carries a lot of gas but is extremely inefficient due to its high weight and small wing. The Takeoff weight for the F-15E in this case is 80,800lb, 33,000 of it fuel (after ground time). This is a max gross weight loading. With a DI of 100, it will take 3,000lb of fuel to climb to 30,000ft (opt cruise for this heavy bird) and take 84nm to do it. I will look at a full optimum profile (unrealistic). Opt cruise begins at 30,000ft with a specific range of 0.046nm/lb. 566nm and 11,320lb later the specific range is 0.054nm/lb at 32,000lb. Bombs away. The F-15E now weighs 62,500lb, 18,800lb of fuel and DI 85. Opt cruise is now 0.059nm/lb at 34,000ft. It takes 200lb of fuel and 8nm to get up there. 10,300lb of fuel back to base with a final specific range of 0.066nm/lb. Under this plan there is approximately 6,000lb of unused fuel but there was no accounting for turning around, combat, time on station, or profiles other than optimum cruise. Let's say the whole mission is flown at 30,000ft and 0.9M for a moment. That alone would eat up 4,200 of that 6,000lb unused. Just doing a Full AB 180 turn to exit the combat zone takes another 800lb (and almost 40 seconds if the crew doesn't want to reduce altitude). Mudhens love to gobble up fuel. Isn't the true range of the F-22/35 classified though? I understand we have to go by what's available/public domain, but like I said - aren't the true figures classified?? mixelflick wrote: Isn't the true range of the F-22/35 classified though? Flight profile is a huge factor. note that the pilot stated that in the F-35 he doesn't have increase the throttle as much to get to desire cruising or tactical speeds. This reminds me of a similar question I posed to an F-22 pilot during the annual open house air show at Nellis AFB. Off memory he stated the same thing. Because the F-22 is more aerodynamically efficient and he doesn't have to increase the power to get to desired speed and altitude he is able to push the F-22 further out than the flight manual says he can. p33lmybanana wrote: I was previously going by what i thought were reputable publications like popular mechanics, national interest and etc. Why were the numbers I've read so far off from what the pilot said? Were the initial figures released just estimates? I definitely will take the pilots word, just wondering what's the best way to research this stuff in the future. Note that the pilot didn't exactly say twice the range; he would do two (vs one) offensive pushes with an F-35A; but an offensive push doesn't mean going all the way back to base and flying back out again; it could be something like flying 200nmi from the base, flying another 300nmi into enemy territory, fighting and returning 300nmi, either to then fly the remaining 200nmi back home (for a total distance of 1000nmi), or doing another strike the same 300nmi in and out and then returning home (for a total distance of 1600nmi). Anyway, as for specific figures. You'll see some articles and websites claim that the F-35A has a combat radius of 590nmi and a range of 1200nmi. These figures exist because 590nmi is the threshold (minimum) combat radius (with an A2G payload) requirement for the F-35A while 1200nmi is just the combat radius x2 (because you fly 590nmi out to a target, then fly 590nmi back home) and rounded to the nearest hundred nmi. Those are requirements though, not actual performance figures; they've just been used in the past because they were the only 'guaranteed' figures, while these days it's just ignorance or malice that causes people to still use those numbers. The F-35A's actual demonstrated combat radius (with an A2G payload) is 669nmi according to the FY2018 Selected Acquisition Report (see the F-35 program documents thread), and a presentation made to Israel by Lockheed states that an F-35A's combat radius with an A2A payload is approximately 760nmi. For 1-way range, doubling the combat radius isn't really accurate either. Combat radius figures include a routing factor (accounting for the need to fly around threats), they nearly always include non-optimal flight for ingress / egress (fast and lower for better effectiveness / survivability but at the cost of more fuel burn), and they can also account for dogfights by assuming things like the pilot will need 3 full 360 deg turns (at maximum sustained turn rate) with full afterburner. When you see a 'range' figure, it's not uncommon for that to include none of that and instead is just how far a jet can fly under ferry conditions (optimum altitude and airspeed for range, no heavy manoeuvring, no enemies to avoid, no afterburner usage, no weapons to carry around / slow you down). Sometimes a jet's ferry range (max distance a jet can fly with as much internal and external fuel it can carry) is also called its range. Based on data I've seen, I'd estimate an F-35A's range / current ferry range (they're the same thing as they F-35 isn't currently integrated with any external fuel tanks) is in the ballpark of 1800nmi on just internal fuel. BROOKLYN, N.Y., June 12, 2018 /PRNewswire/ -- Pratt & Whitney, a division of United Technologies Corp. (NYSE: UTX), today announced a Growth Option 2.0 upgrade for the F135 engine, which powers the fifth generation F-35 Lighting II aircraft, that can provide increased power and thermal management system (PTMS) capacity. The Growth Option 2.0 upgrade can be configured based on customer requirements to offer a range of PTMS improvements, an area which is emerging as a critical enabling capability for future block upgrades to the F-35 aircraft. The near-term iteration of this upgrade can provide a significant improvement in PTMS capacity. "As the F-35 program moves forward with the Continuous Capability Development and Delivery (C2D2) strategy, we strive to stay in front of propulsion advances needed to enable F-35 modernization," said Matthew Bromberg, president, Pratt & Whitney Military Engines. "We're continuously assessing customer needs and responding with technology insertion options to keep them ahead of evolving threats." Even 1800nm is very conservative, if no routing factors are involved. Based upon pilot anecdotes, the F-35 can fly 900 miles on 5000lbs of fuel at optimized speed/altitudes. That didn't include a payload, so that would certainly have an affect on the numbers. Of course on the next 5000lbs, it could fly even further, due to less weight/drag, and so on. That was a great interview. Really puts the F-35's superior range/persistence into perspective vs. legacy platforms..
1 Australia: "Another submission from retired Wing Commander Anthony Wilkinson says that in its capacity as a multirole aircraft, the F-35's bomb load is too small and its range is too short to be effective in the South Asia region." *** So it is to my understanding that Australia wanted a long range interceptor and strike aircraft to replace the F-111. They bought Super Hornets as a stop gap, and they intend for f-35 to fit that role in the long term. And as great as the f-35 is, it might not be best for that role when considering range and payload. What Austrailia wanted was clearly spelled out in the AIR6000 submission, which is a literal outline of the requirements. youre confusing a small cabal of RAAF, industry, and pundits, who never wanted to see the F-111 retired and favored F-22s with "Australia"
Lockheed Martin officially offered F-22/F-35 hybrid plan to the Japanese government on Friday. The unit cost is estimated at ¥20 billion($178 million). Boeing and BAE Systems also offered the remodeling plan of the existing fighter like F-15 and Eurofighter but Japanese official said that Lockheed’s plan better meets the demands. Isn't that almost develop-a-F-35 kind of money? The next-generation fighter program is estimated to cost about 6 trillion yen ($54.2 billion), including development, acquisition and maintenance. So buying and maintenance of the planes are already taken into account. This could be a partial life cycle cost estimate already. Considering that Japan's economy is quite larger than France's and the fact that the US may also partially fund the program if they want to upgrade or augment their existing fleet of F-22s, this doesn't seem so impossible. Got a hand it to France tho, they really pushed through where most countries would simply scrap the program and call it quits. The door was wide open for them to join the Eurofighter consortium. Lots a pride those French have.